Pictured below is a recently completed Mercedes Sprinter vinyl van wrap fresh out of our 3M Certified shop. Although it may appear that this installation may be a combination of traditional cut graphics and wrapping; it is actually a full wrap. We often find situations where the costs associated with large partial vehicle wraps with cut lettering offer very little savings over utilizing a full wrap strategy. The big advantage with going with a full wrap is Paint Protection. Upon ultimate removal, traditional lettering always leaves a “ghosting” where the graphics were installed. Everyone has seen the Uhaul or other commercial trucks with a grey apparition of a former vehicle owner’s logo, etc. Full wraps are the best way to avoid this. Also used on this project was 3M’s Envision films. These high scratch resistant films are designed to stretch deep into the Sprinter’s body channels. Envision films are also less costly to remove. 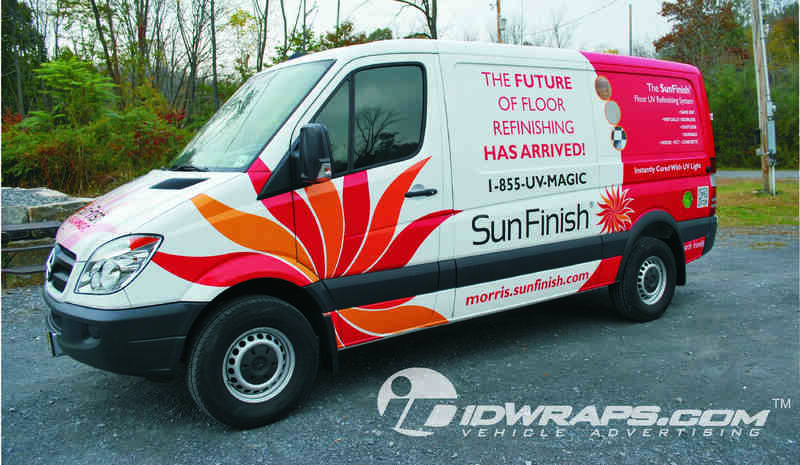 Our client, Sunfinish- out of Sparta, NJ is a provider of premium UV cured flooring finishes. Not only are they more durable than traditional finishes, but there is no waiting period for their products to dry. 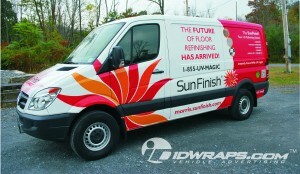 Check them out at www.sunfinish.com. National installation and service near you.